Recap: What Do We Mean by Layers? As we’ve talked about before, we can create three-dimensional characters by showing both external (action, body language, subplots, external goals) and internal (emotions, internal goals, internal monologue, fears, flaws, false beliefs) aspects. But there’s more we can do with character-focused layers beyond just ensuring that we’re balancing different types of narrative and storytelling. Why Do We Want to Use Layers? One reason to use layers with our characters is to make them realistic. People are complex and complicated, so our characters should be too. How can we create realistic and unique characters? Add layers... Click To TweetThat realism can overcome the limitations of their stereotypical or “tropey” aspects. Surprisingly, avoiding all stereotypes, clichés, or tropes with our characters isn’t our goal, as those characters wouldn’t feel realistic because we all embody at least one stereotypical aspect (such as my love of chocolate *smile*). Instead, we want to add layers to make them more three-dimensional beyond their stereotypical traits. six months behind on his rent. If we do our job right when writing a character and keeping their characterization consistent, the different types of layers interact, and those interactions play out in subtext. All that subtext says even more about our character, leading to the impression of a character who’s more than the sum of their parts. If we don’t do our job right, and those layers don’t interact in the subtext or reveal consistent characterization, we’ll end up with a non-realistic puppet or characters that feel too derivative. Back when the big debate in the publishing world was about charging for worked-over fan fiction stories, some fanfic writers didn’t understand why their changes didn’t erase the plagiarism issue, but as we’ll get into in the next section, a character’s essence goes deeper. Beyond realism, there’s another benefit of using layers with our characters. Like with the example of the Navy SEAL above, adding layers to our characters creates something unique. Sure, there are lots of Navy SEAL characters, but there aren’t any others with an identical mix of layers. 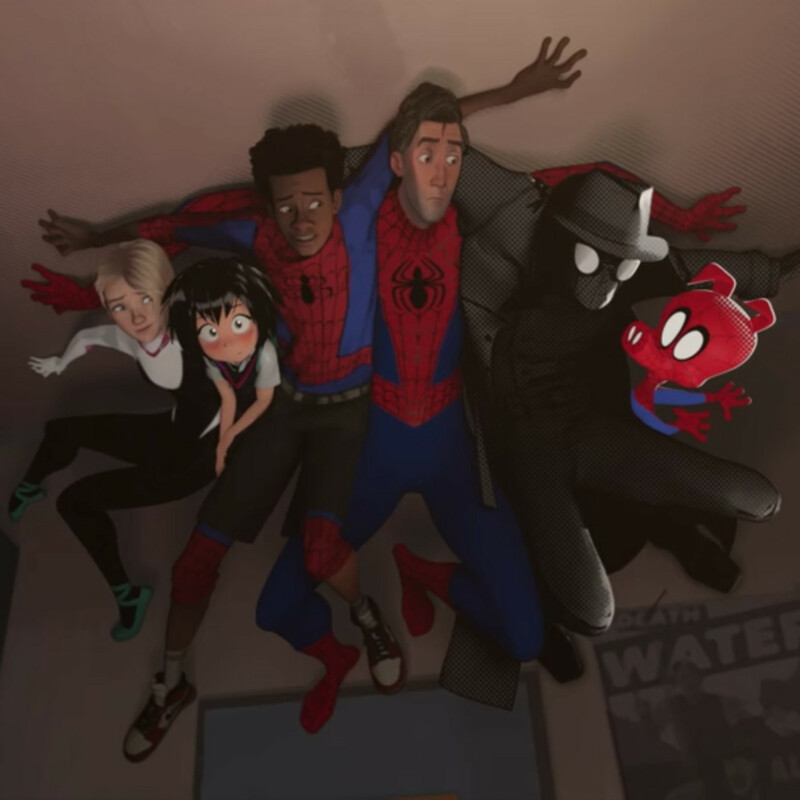 In Spider-Verse, the bad guy creates rifts between parallel universes, and various spider-characters from different multiverse versions of the world end up stuck in the version with main character Miles Morales. So the Spider-Man People Characters have to work together to save all the realities. What does it take to make a unique character? Maybe not as much as you think... Click To TweetAs they each give their introduction, similar wording and graphic elements are used. Sometimes, the movie even has them speaking in sync, emphasizing the echoes. Yet despite all that, each of the Spidey characters is unique and distinct in the movie. They don’t feel like clones in the slightest. 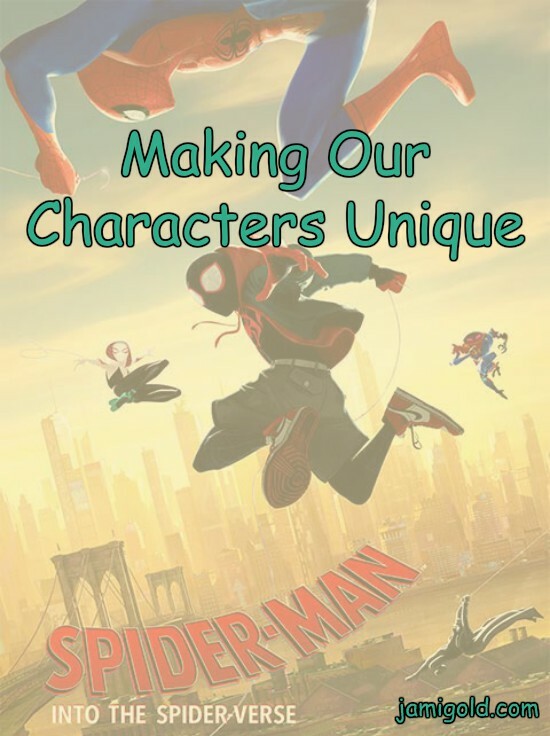 The animators drew some of the characters in different animation/comic book styles: anime for Peni Parker, cartoony for Spider-Ham, and black-and-white with dot-shading for Spider-Man Noir, for example. But they have different personalities, worldviews, compassion levels, voice styles, etc. as well. The dialogue of Noir’s character wouldn’t be said by any other character. The jokes that Spider-Ham makes wouldn’t be made by any other character. The advice from Peter B. Parker fit that character’s role and no other. And so on. In other words, they had different layers. Different styles of interaction, connectedness, coping skills, struggles, etc. Those bullet points mentioned above were slightly tweaked for each one, and those slightly tweaked layers—with consistent characterization and subtext—were enough to make them each distinct. Have you ever read a character that felt too stereotypical or formulaic? Did they lack layers? Have you struggled to make a character unique? Or if you’ve read a character that felt unique despite their tropes, what created that sense? Can you think of other examples of character layers? If you’ve seen Spider-Verse, do you have any other insights? Fascinating stuff, Jami! How would you define a character essence, exactly? I know you mentioned backstory wound and origin story as part of the essence, but what is a “character essence” precisely? Also, I liked the example you gave of the Navy SEAL. I reread your old post, and I find that I have a deeper understanding of the layers interacting and conflicting with each other now, since I’ve become a much more experienced writer than I was two years ago. I’m writing about this “character essence” question in tomorrow’s post. 🙂 Thanks for the idea! This is interesting information. So far, I have written 4 non-fiction books, I have had in mind to write a novel. This post will help me in the future project. Thank you. I love using the inner monologue, it fleshes out the main character and adds layers. It also accentuates the point of view since I usually write fiction in the limited third person.